So many people, including ourselves, often expect our grief to be finished by the one-year anniversary of the death. People expect us to move on and their words shame us for still being impacted. Often, we, ourselves, shame ourselves for not getting “over it” quicker and we beat ourselves up. The path of grief, though, is not confined to just one year. It is a life-long journey that manifests itself time and time again. The following is an excerpt from the book, The Gift of Second: Healing from the Impact of Suicide. In 1969, after extensive research with dying individuals, Elisabeth Kübler-Ross, a Swiss-American psychiatrist, created the theory that people grieve in stages. She discovered that each person, near death, experienced a series of stages as the end of their life drew near: denial, anger, bargaining, depression, and acceptance. Widely used in the mental health profession and accepted in the general population as well, this concept has since been commonly adopted by the world to describe the stages an individual goes through after losing a loved one. Although the theory created by Kübler-Ross is strong and has merit, it gives the illusion that, at some point, grief is complete. We, as survivors, know the grief is never finished. The intensity lessens over time, and the consuming emotions become more stable, but grief is never fully complete. When folks expect their grief to end and their pain to be erased, they are, oftentimes, focused on an imaginary timeline, waiting for that magical day to wipe away their hurt and allow their life to resume as it was before this great tragedy. When we expect the impossible, we are always disappointed. Grief is neither linear nor does it adhere to a particular path. I created this image to depict the manner in which grief really affects us. The Realistic Grieving Path begins with a suicide, causing a surviving individual to begin the grief process. The feelings one experiences are overwhelming, chaotic, erratic, and all-encompassing. I liken this feeling to the destruction of an earthquake. Not only does it rock our worlds and bring devastation to our lives, but it also creates cracks in our foundation, causing us to doubt all that was. The picture depicts waves of grief similar to an earthquake’s seismic waves. One moment we can feel intense heart- ache and sadness, and then next moment we are full of anger and rage. Always unpredictable and never convenient, walking through grief can be unbearable much of the time. As survivors work through their grief, they will eventually arrive at a phase titled ‘New Normal.’ New normal is labeled as such because we will never return to the person we were before the suicide. How could we? This phase becomes our new status quo, the phase in which we go about our days, no longer so consumed with grief. Life begins to carry on in this new normal stage until a ‘life event’ occurs. A life event can be positive, such as a wedding, the birth of a baby, or a graduation, or negative like the anniversary of the suicide, a serious illness, or a job loss. Regardless of the event, this scenario acts as a trigger and causes the survivor to walk through the grief path again as they process the death of their loved one once more in light of the new events. As I prepared for my wedding, I thought very little of the absence of my mom for the ceremony. Nor did I think of her at all during the honeymoon. Upon returning from the honeymoon; however, while setting up house with my husband, something out of the blue, it seemed, occurred. Two days after returning, my husband and I sat down to make our first grocery list as a married couple. Every idea he had for meals seemed horrible, and I began to snap at him for each suggestion. Eventually, my wise husband asked, “What is the matter? Why are you so frustrated?” Without pause and without thinking, I began to sob. The only thing I could get out between deep crying breaths was, “My mom should have been at my wedding and she wasn’t.” To me, at the time, (and I am sure my husband as well) this seemed so odd and unexpected. 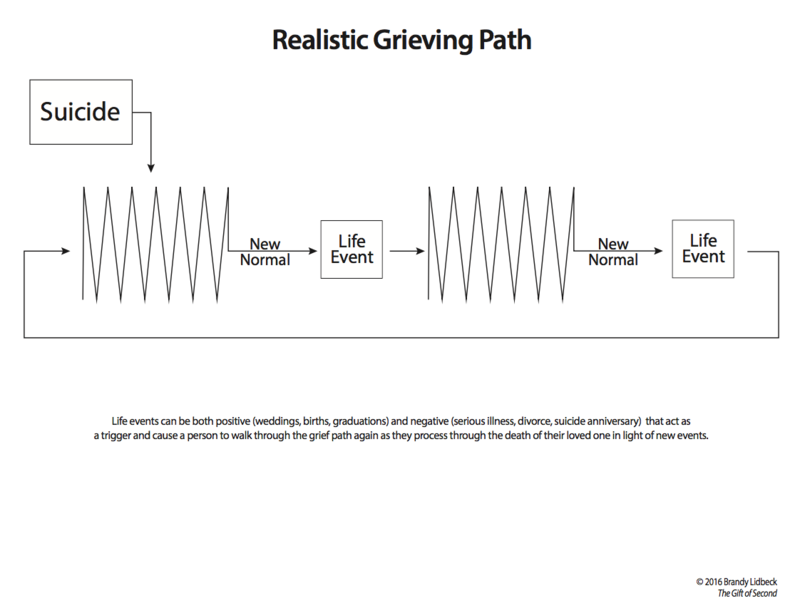 In reality, it is a perfect example of a ‘life event’ as described above in the Realistic Grieving Path. The wedding took place seventeen years after my mom’s suicide and, leading up to the wedding, I had been relatively unaffected by her death as it pertained to wedding preparations. The major life event, though, rocked my world and caused me to walk through the process again as I mourned my mom missing my wedding. When an individual has experienced such a tremendous loss as suicide, the entire body feels it. Symptoms of grief typically manifest as follows: Difficulty sleeping, Loss of appetite, Loss of appetite, Headaches, Crying, Aches and pains, Anxiety, Aches and pains, Isolation, Anger, Guilt, Sadness, Fatigue, Shock, and Depression. Each of these symptoms feels ever-present in the beginning, and the survivor may fear these feelings will consume them always. In time, though, these feelings will lessen in intensity and come in waves instead, often arising without warning. Eventually, feelings will surface with only a life trigger or memory of the loved one. Getting through will not always be so overwhelming. The grief path is normal and one to fully expect as you traverse life after suicide. We will never be ‘over’ the pain and devastation completely, but it won’t always dictate our lives. This passage was pulled from the book, The Gift of Second: Healing from the Impact of Suicide, by Brandy Lidbeck. If you or someone you know has lost a loved one to suicide, grab a copy of the book today. Watch this short book trailer video to get a sense for the heart of the book. It has been 6 months since I lost my sister. I don’t think I’ve found a new normal but I connect with your message. My sister was my “unconditional”, always there for you. I thought I was the same for her and feel so selfish this could’ve happened. My heart physically hurts daily and I too wonder the long term physical effect on my heart but, it seems it only matches the daily emotional suffering. I try not to think too far into the future. I can’t imagine this world without her. It is helpful to hear from someone who has lost their sister. I was so blessed and always knew this. I just never thought I’d face a world without her. Thank you for your message. Your book is one of the best that I have read about and for survivors of suicide. For me, it really addressed all the issues associated with this type of loss with great understanding and anticipation of what a survivor feels in the process of finding their new normal. I have lent my copy to another mom and recommended Gift of Second to several others (who agree), a couple of them being friends trying to support another friend through loss. Reading this excerpt again was quite timely. Today is the third anniversary of the loss of my son to suicide. Tomorrow would have been the day he graduated from college and I know he will be remembered at the ceremony. Since May 17, 2014, I have met many inspiring moms, children and siblings who travel along this same path. Some of them have taken up the cause to either support other survivors or to educate parents and others in the signs of depression and mental illness (at the time, I had no idea of what my son was going through). While not publicly outspoken, I feel that I am somewhere in between both missions and hopefully one day I’ll find my place in all of this. I also appreciate your Christian perspective, which is important to me as faith is probably the greatest strength I’ve found in all of this. I’ve thought about leaving a reply for a while and this seemed to be a good time to do so. So again, I say thank you for your book and your work towards the healing of other survivors. Three years, Maureen? I am so sorry. Anniversaries feel, to me, both so long ago and just like yesterday. I am glad this posted today and it spoke to you. That chapter about God was the one I wrote and rewrote more than any other not wanting to alienate anyone but also wanted to speak my truth! Thank you for reaching out. I appreciate it! Brandy, I read your book yesterday. I’m only 6 months into this devastation since losing my sister to suicide. I’ve read countless books, visit websites almost daily and have been in counseling for the last 4 months. Your book touched on every area I am experiencing. The chapter on God was one of the most significant to me and I’m so appreciative this was included. I so needed to read this chapter as I feel I cannot survive this without God in my life. This is just too big, too consuming for me otherwise. After reading your book, I ordered your book for my brother. This is the only book I’ve read that I felt I could pass along to him. For myself, I plan to read again and focus on answering the questions at the end of each chapter. Thank you for this site and your book. I can’t imagine navigating this devastation without these resources and I can’t help but think of the many affected people in years past that likely suffered this alone. Thank you. Kelley, Thank you for reaching out. I am so sorry to hear about the loss of your sister. Still so fresh and new. I am humbled by your kind words and so thankful the book has been helpful to you. That is exactly why I wrote it: to provide for others what I did not have when I lost my mom. I hope your brother also finds comfort in the book. Reach out anytime! I am sitting here crying as I read this. So true. I need to read Tony Dungy’s book. Just two days ago I remember thinking to myself that I am damaged (or something like that) forever. My son’s suicide was 7-1-13, coming up on four years. I will never stop grieving.